I just learned that a sister project to the LOFAR LBAs (low band antennas) is underway in the US. This project is called the Long Wavelength Array (LWA) and like our LBAs uses large numbers of spindly looking antennas to survey the sky at 20-80MHz (radio frequencies below the FM band down to the limit of what will pass through our ionosphere). 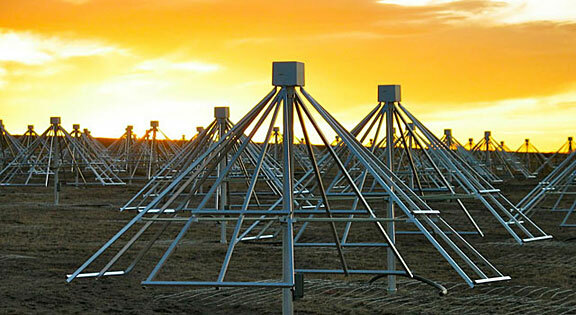 As part of the LWA project, a nice write up of the motivations for low frequency radio astronomy appeared online last week: "An Astronomers Field of Dreams". They're in the middle of putting together their first station, and hope to begin observations this summer. For more details see the LWA website. Multiple antennas of the LWA-1 station of the Long Wavelength Array in central New Mexico, photographed at sunset. Each antenna stands about 1.5 meters (5 feet) high and about 2.7 meters (9 feet) across the base. Image credit: LWA Project (at UNM).